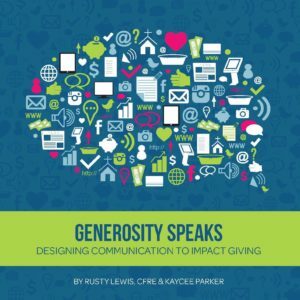 New Generosity Communication E-Book Coming Soon! What you say (or don’t say) impacts what your people give (or don’t give). There’s a direct correlation between the two. And, if done well, you can increase the generosity of your church by implementing a basic (but strategic) communication plan. That’s the premise of our new e-book called “Generosity Speaks: Designing Communication to Impact Giving” launching here in just a few short weeks. I’ve teamed up with Kaycee Parker, founder of KP Communications, to write this one. I know you’ll appreciate her insight from 15 years of experience in the communication world – namely the last few as communication director for a mega church in the St. Louis area and now working freelance to support churches across the country. You’ll discover the often missing link between ministry and generosity (and how to fix it). We’ll explain a bit about why givers give, and how you can reach your givers. You’ll get specific (and quickly implementable) ideas on weekly, monthly, quarterly, and annual communication strategies to accelerate giving. We’ll explain how to promote and encourage generosity through a variety of communication channels. If you liked my e-book about giving technology, you’ll like this one too. In just a couple of weeks you’ll be able to download your own free copy. So stay tuned to my blog to make sure you know when it’s available! UPDATE: this e-book is now available for download!